Trio Italiano® is a combination of three shapes in one box: Rotini, Penne and Shells. 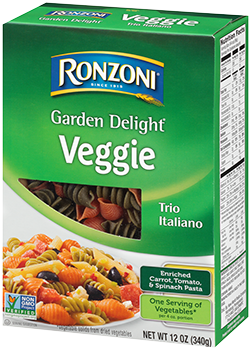 With three shapes in three colors Ronzoni Garden Delight® Trio Italiano® pasta is perfect for showcasing the vegetables in any meal, but is especially appealing in cold salads. SEMOLINA (WHEAT); DURUM FLOUR (WHEAT); DRIED CARROTS, DRIED TOMATO, DRIED SPINACH, NIACIN, FERROUS SULFATE (IRON), THIAMIN MONONITRATE, RIBOFLAVIN, FOLIC ACID.